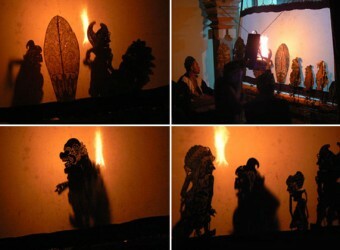 Bali Traditional Tour They perform Wayan Kulit which shadowgraph show. Those dolls made from animal skin and made by saint people. The story follow Indonesian history , culture and legend. The complete wayang kulit troupes include dalang (puppet master), nayaga (gamelan players), and sinden (female choral singer). Shadow puppet show is a small performance compared to dancing performed by human, but I was completely attracted to its fantastic atmosphere.